Dorothy Evans is fond of using the sort of adjective once favoured by the Royal Navy for naming warships: for her educationalists are 'indomitable' and Falkland Islanders 'intrepid'. She herself is undoubtedly indefatigable. Miss Evans has scoured the archives and records of St. Helena to produce a comprehensive, indeed definitive, record of educational development there. Her accounts for the two dependencies of Ascension and Tristan da Cunha are necessarily briefer, though adequate. Not so her brief survey of education in the Falkland Islands. That is disappointing and Miss Evans may have relied upon too narrow a range of informants and sources. (There are some surprising omissions from her list of the former). Sadly, for example, there is little coverage of the role of travelling teachers, who toured the settlements by horse, by motor-bike, by sea-plane, and by boat to supervise small isolated groups of pupils. Their often vivid experiences would have provided a welcoming leavening of anecdote to the narrative. Oral history provided by the older members of any community so often produces gems and insights that would otherwise be lost. Time and distance may have prevented the author from working this rich source. Teachers everywhere are blessed (or cursed) with nicknames; sometimes cruel, generally apt, and often fascinating. All who know these four islands are aware that the islanders possess a special gift for bestowing these. I should have relished learning some of the more colourful ones. Many readers will recall what a satisfactory experience it was to learn one's own nickname. Education in all small isolated communities presents special problems. On St. Helena it has long been a problem (and perhaps remains so) to motivate boys to pursue studies. This problem is exemplified by two photographs. On the front cover small girls happily surround their teacher but the boys sit apart and apparently aloof. Then, on page 204, there is a group photograph of St. Helena's senior education staff: of the seventeen only three are men. How to motivate young boys is a fundamental problem about which one would have welcomed more exposition. Are young males possessed of an in-bred cynicism that education has little value because of limited job opportunities? Do they seek only practical skills? Are they too easily lured by the fascination of opportunities offered on Ascension Island? These are problems that have long exercised the educationalists of St. Helena and perhaps deserved more attention. 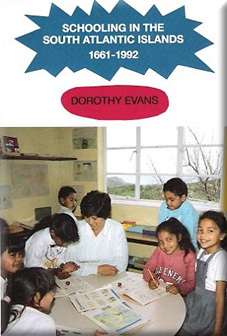 This book was commissioned by St. Helena's Education Department. Miss Evans has served them well. However, it is reputed that a small girl once reviewed a book about penguins in these terms: "There is more about penguins in this book than I really want to know''. I felt much the same about schooling in the South Atlantic Islands when I put down Miss Evans' book.